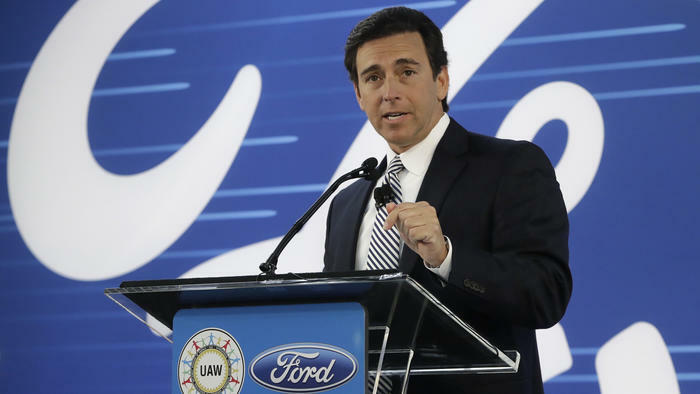 Ford Motor Co. is replacing Chief Executive Mark Fields amid questions about the company’s current performance and future strategy, according to a person familiar with the situation. Fields is retiring at age 56 after 28 years at the company, said the person, who spoke on condition of anonymity because the official announcement hasn't been made. Fields will be replaced by Jim Hackett, who joined Ford's board in 2013, the person said. Hackett has led Ford's mobility unit since last year. As CEO, Fields began Ford's transition from a traditional automaker into a "mobility" company, laying out plans to build autonomous vehicles and explore new services such as ride-hailing and car-sharing. Under Fields, Ford achieved a record pretax profit of $10.8 billion in 2015 after the company's new, aluminum-sided F-150 pickup went on sale. But there were rumblings that Fields wasn't focusing enough on Ford's core business, as popular products like the Fusion sedan grew dated and Ford lagged behind rivals in bringing long-range electric cars to the market. The stock price sagged, and electric car maker Tesla Inc. even passed the 114-year-old Ford in market value. Ford's stock price has fallen almost 40% in the three years since Fields became CEO. "Mark Fields was given the nearly impossible task of making the utterly conventional auto manufacturer Ford Motor Company into a high-tech information-style company with share values to match," said Jack Nerad, the editorial director for the car shopping site Kelley Blue Book. "Despite turning in credible profits, Fields was unable to turn Ford into a stock market darling, and that may well prove elusive going forward." Hackett is the former CEO of Steelcase Inc., one of the world's largest office furniture companies. He is credited with transforming that company, in part by predicting the shift away from cubicles and into open office plans. But he also cut thousands of jobs and moved furniture production from the United States to Mexico to stem massive losses at the company. Hackett will have to placate investors worried about Ford's sliding U.S. market share and product decisions. Ford's U.S. sales are down this year in part because it doesn't have offerings in popular segments like subcompact SUVs and midsize pickups. Investors also worry that Ford is falling behind its rivals. GM's Chevrolet Bolt electric car, with 238 miles of range, went on sale last year; Ford is working on an electric SUV with 300 miles of range, but it's not due out until 2020. Mary Barra — who became GM's CEO about six months before Fields became Ford's — has also made a series of headline-grabbing moves, such as forming a partnership with the ride-hailing company Lyft and pulling GM out of unprofitable markets, including Europe, India and South Africa. Ford also made investments in new mobility companies and announced it would have a self-driving shuttle on the road by 2021, but its efforts haven't swayed investors. As part of the shake-up, several Ford executives are taking on new roles. Jim Farley, who led the company's European division back to profitability in recent years, will become vice president of global markets and will oversee Lincoln, sales and marketing. Joe Hinrichs, president of Ford's Americas division, will oversee global product development, manufacturing and quality. Marcy Klevorn, Ford's chief technical officer, will replace Hackett as the head of Ford Smart Mobility LLC, Ford's future mobility unit.